Every organization—no matter the size—has data, network, IP, and other information to protect. 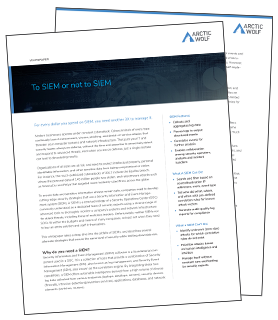 When implemented well, SIEM (security information and event management) is a great tool that can identify threats, protect your information and keep your business secure. But there’s a catch: a SIEM requires constant effort to sustain, and must be tweaked and monitored by expert staff. Otherwise, the SIEM will produce a slew of false positives, overwhelm analysts, and miss actual threats, thereby exposing the business. superior protection with reduced effort and costs.